JACKSONVILLE BEACH, Fla. April 15 2019 Police say they arrested a 16-year-old after they found him carrying two loaded handguns and a ski mask at a Florida Catholic school. The Florida Times-Union reports that employees of St. Paul’s Catholic School spotted the teen acting abnormally on campus Friday and summoned a Jacksonville Beach police officer, who was providing security. The officer confronted the teen and found he was carrying the two guns and the mask. He was arrested and charged with possessing firearms on school property and for giving false names to the officer. 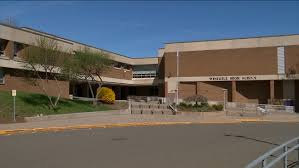 His name has not been released because of his age and it is unknown if he has any connection to the school, which has 600 students from preschool to eighth grade.